Wellington was originally the world’s largest strawberry patch, the Flying Cow Ranch. C. Oliver Wellington bought 18,000 acres in central Palm Beach County that eventually would be called the Village of Wellington. 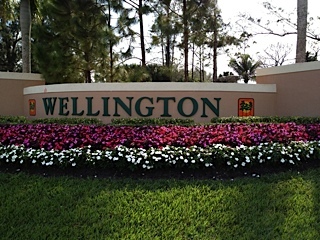 Wellington began as a planned unit development approved by Palm Beach County in 1972. Wellington holds the largest and longest running horse show in the world from January to March (3 months), is considered the top International Equestrian destination for the diverse equestrian disciplines of show jumping, dressage, and polo. Each year hosts 26-goal polo matches including the Gold Cup and the U.S. Polo Open at the Palm Beach International Polo Club. Wellington has a large renovated public library, multiple recreation centers, a number of public parks and ball fields, and hosts seasonal events.Wellington Amphitheater regularly hosts musical and film events in their outdoor venue.There are a number of entertainment and cultural venues – such as the Kravis Center for the performing Arts and the Norton Museum of Art – in nearby West Palm Beach. Wellington has a large regional mall The Mall at Wellington Green along with a many other nationally known retailers located in outdoor shopping venues along the major commercial highways. Beach activities are a half hour’s drive time, due east, to the Palm Beaches. For variety, from Wellington one can access Fort Lauderdale less than one hour away or travel to South Beach approximately a one and half hour’s drive.